VATICAN CITY Pope Benedict XVI offered a glimpse of what his post-resignation life will be like, telling a gathering of Rome's parish priests that he will be "hidden to the world" after he steps down at the end of the month, CBS News correspondent Allen Pizzey reports . His latest public comments came as the Vatican revealed that Pope Benedict hit his head during his March 2012 trip to Mexico, but denied the accident had any "relevant" role in his resignation. It was the most recent revelation of a hidden health issue to emerge from the Holy See since the pope's shock announcement, and adds to questions about the gravity of the pontiff's condition. On Tuesday, the Vatican said for the first time that Benedict has a pacemaker, and that he had its batteries replaced just three months ago. Pope breaks recent silence over what U.N. calls "ethnic cleansing"
Compared to a bittersweet atmosphere surrounding the pope's final publicly celebrated Mass on Ash Wednesday, Thursday's appearance was fairly combative. 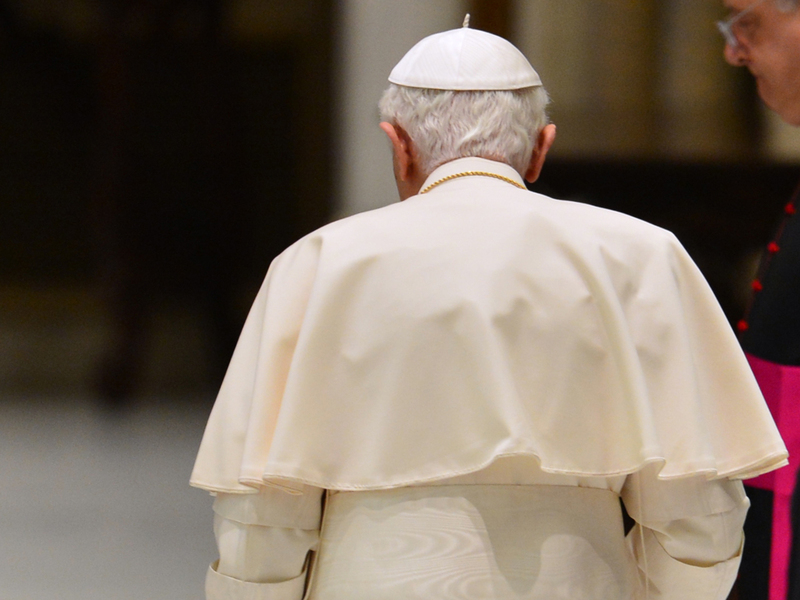 Pope Benedict blamed the media for what he called a distorted interpretation of the Second Vatican Council in the early 1960s for many "calamities" that plague the Catholic Church today. He nailed that point home on Thursday, during a 45-minute, off-the-cuff reminiscence, blaming botched media reporting of the council's deliberations for having reduced the work to "political power struggles between various currents in the church." "Our job in this 'Year of Faith' is to work so that the true council, with the strength of the Holy Spirit, is truly realized and that the church is truly renovated," he said. During Wednesday's appearance, Benedict's frailty -- which played a part in his decision to resign -- was evident as he was wheeled down the corridor, said Pizzey. But so, too, was the faith and sense of duty which made him accept a job he said he never wanted. Benedict said the Mass was a "good opportunity to thank everyone . . . and to ask for special remembrance" in prayer. Those closest to Benedict say they are sad he's going, but respect his decision, according to a senior Vatican communication advisor Greg Burke. "This is really a courageous move [by] somebody who was considered such a traditionalist, making a decision that goes against six centuries of tradition," said Burke. In his homily, Benedict lamented the internal church rivalries that he said had "defiled the face of the church"  a not-too-subtle message to his successor and the cardinals who will elect him. Benedict will leave Vatican City by helicopter at 5 p.m. on February 28 for Castel Gandolfo, about sixteen miles away. Three hours later he will go from being the spiritual leader of 1.2 billion Catholics to the first retired Pope in more than 600 years.